Kred.ly started opening its very limited beta this week. My invitation arrived bright and early on Friday after requesting an invite in September when I found out about the new service from PeopleBrowsr. Kred is an online social influence tracker and calculator like Klout and PeerIndex. I will go through my impressions as they happened; starting off with the email. Subject: Your invitation to Kred is here! Your request for early access to Kred is approved. Our team has worked on Kred for over two years and it's ready for Beta review. We all have Influence Somewhere. Kred is a brand new way to understand your Influence and Outreach globally and within Communities formed around interests and affinities. Separate Scores for Influence and OutreachStrong real-life relationships are based on Trust and Generosity - and that’s how Kred works, too. Influence, scored from 1-1000, shows whether your posts convince others to act. Outreach demonstrates your generosity in retweeting and replying to others. CommunityReal influence comes from expertise and passion, so we calculate Kred in Communities formed around what they care about most. Learn more about our scoring rules here. Complete TransparencyYou can always see how actions count towards your score - and your friends', too. Just click on the Activity Statement menu item. Offline Kred Kred integrates offline achievements with your online identity. We pre-loaded a couple of real world accomplishments for some users and have included a list of examples. To add your own, click on the 'Get More Kred' menu tab once you're inside the Kred site and select Offline. PrivacyKred offers full control of privacy settings to anyone visiting our site. After logging in, click over to our Privacy page for a full explanation. Many of the features in Kred started as ideas from our community of friends and colleagues, so we would love to know what you think. Send your comments to contact@peoplebrowsr.com or tweet @kred. PS Kred.ly looks best in Google Chrome, our favorite browser. If you don't have Chrome, you can download it here. I did not link to the privacy page on purpose because it was blue, but not hyperlinked in the actual email. It seems they will show me exactly what makes up my score; surely that isn't totally true because the system could be gamed. Upon arriving at the website I go to the bottom point of the Kred.ly badge/logo and login with Twitter. Once logged in I expected to see my stats because I am logging into my account after all. No so much. The profile of Tim O'Reilly is front and center (it still is today when I login). I found this odd, and found that he is an advisor to Kred/PeopleBrowsr as noted in the footer of the website. Continuing on, I type my Twitter handle (@dbin78) into the field on the top and click on the "See your Kred" button. This pulls up the below page (click to enlarge). You will notice my Kred tab highlighted in blue, along with @peoplebrowsr and @timoreilly in black. Hi there again Tim! PeopleBrowsr is a social analytics company and, as mentioned earlier, is the owner of Kred. So what's the problem with these two connections? Nothing really, unless you are supposed to be a impartial third party. It is just a bit to much up in your face favoritism and promotion for my tastes. The next thing I tried, as I do with all new sites, is to connect my login/data networks. I clicked on the LinkedIn logo to do just that to find out that it is not yet supported, either is Facebook. That's right, this new online influence measuring tool only looks at Twitter. Looking back it was never said that it would, but it is thinking about it now. When you click on the icons they ask "Should we integrate Facebook and LinkedIn? Click to vote. "; to vote you have to Tweet "@Kred, I vote to integrate Facebook and LinkedIn in the #Kred score". To me they should be working on adding it anyway and asking for what is essentially a promotional Tweet is odd. I was surprised to find that their scoring system is fully transparent, but I was not able to link to it so I have made it available here. The profile links seem to only be available to people with accounts; mine is http://kred.ly/dbin78 and I would think it will be public at some point otherwise there is not much use for the score. There are Kred scores for each community (like Klout's topics) that you are active in that then roll-up to make your global score. They are not so good at determining what you are influential about. My top community is Software Dev with Blogger pulling up the rear... pretty much upside down for me. On the top of the Activity Statement tab you are encouraged with the below header to increase your score and watch it increase live on the screen. Clicking the bold "Send a post and mention" pulls up a Tweet box. This is interesting and seems ripe for being abused. Unlike other similar services Kred brings the real world to social scoring by letting you claim offline activity that could increase your score. To do this you have to submit a file (PDF, PNG or JPEG) to the Offline Scoring Committee for review. You can attempt to get Kred for anything and have it applied to a specific community or just your global score. 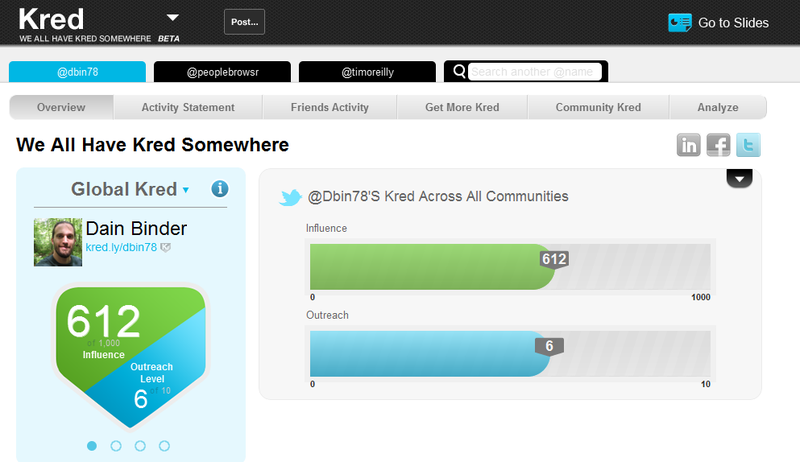 Overall Kred brings some interesting variations to the social scoring arena. In my opinion they have a lot of work to do to be credible themselves. My main concern revolves around people gaming their score, I also do not like the perception of favoritism. I do welcome the addition of third player to the space. Breakthroughs are sure to happen with Klout, PeerIndex, and Kred working on the equation to quantify social influence. Update - November 28, 2011 - Kred made some updates based on this review; as you can see from the comments they have been very proactive. The favoritism has gone away by removing the references to PeopleBrowsr and Tim O'Reilly. Upon login you are now greeted with your overview. "Coming soon" has replaced "Should we integrate Facebook and LinkedIn? Click to vote." The scoring guide has moved out from behind the login wall. Thanks for your first impressions of Kred. We believe that the emphasis on Transparency and Community should help to counteract any gaming of the system since any user will be able to check the source of anyone else's scores. The Community aspect will also help because because even if a user tries to 'game' one community, it may not have an effect on any other. Based on your input, we are checking the Privacy link for future mails. We take all feedback from our community very seriously and hope you'll find Kred a useful tool as it continues to evolve. Thank you so much for this review, Dain. Love it. Onto these tweaks for you with engineering team now. Also, we are making the rules page available for everyone, so you will be able to link to the most up to date version on the Kred site. Always happy to get your ideas and improve kred. Dain, thanks for the update to the post. FYI - today we are collapsing the header inviting you to tweet at the top of the Activity Statement tab. © 2014 Dain Binder. Simple theme. Powered by Blogger.